But researchers warn that lack of available data from published and unpublished trials leads to great uncertainty around true effectsMost available antidepressants are ineffective, and some may be unsafe, for children and teenagers with major depression, according to the most comprehensive comparison of commonly prescribed antidepressant drugs so far, published in The Lancet. Without access to individual-level data it is difficult to get accurate effect estimates and we can't be completely confident about the accuracy of the information contained in published and unpublished trials. It has been widely argued that there needs to be a transformation of existing scientific culture to one where responsible data sharing should be the norm. However, the true effectiveness and risk of serious harms such as suicidal thoughts and attempts remains unclear because of the small number and poor design of clinical trials assessing these antidepressants, and the selective reporting of findings in published trials and clinical study reports, caution the authors. 'The balance of risks and benefits of antidepressants for the treatment of major depression does not seem to offer a clear advantage in children and teenagers, with probably only the exception of fluoxetine. We recommend that children and adolescents taking antidepressants should be monitored closely, regardless of the antidepressant chosen, particularly at the beginning of treatment,' explained co-author Professor Peng Xie from The First Affiliated Hospital of Chongqing Medical University, Chongqing, China. Major depressive disorder is common in children and adolescents, affecting around 3% of children aged 6 to 12 years and about 6% of teenagers aged 13 to 18 years. Psychological treatments are recommended as the first-line treatment for depression in many clinical guidelines, and in 2004 the US Food and Drug Administration (FDA) issued a black box warning against the use of antidepressants in young people up to 24 years old because of concern about increased risk of suicidal thoughts. However, use of antidepressants has slowly increased between 2005 and 2012. The proportion of US children and teenagers (aged 0–19) taking antidepressants increased from 1.3% to 1.6%, and in the UK from 0.7% to 1.1%. Sertraline is the most widely prescribed antidepressant in the USA and fluoxetine is the most common in the UK. Cipriani and colleagues did a systematic review and network meta-analysis of all published and unpublished randomised trials comparing the effects of 14 antidepressants in young people with major depression up to the end of May 2015. 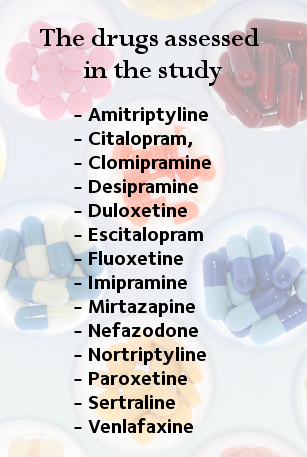 They ranked antidepressants by efficacy (change in depressive symptoms and response to treatment), tolerability (stopping the medication due to adverse events), acceptability (stopping the medication due to any cause), and associated serious harms (suicidal thoughts and attempts). They took into account the quality of included studies (Cochrane risk of bias) and also assessed the overall quality of the retrieved evidence (GRADE). Analysis of 34 trials involving 5260 participants aged 9 to 18 showed that the benefits outweighed the risks in terms of efficacy and tolerability only for fluoxetine. Nortriptyline was less effective than seven other antidepressants and placebo. Imipramine, venlafaxine, and duloxetine had the worst profile of tolerability, leading to significantly more discontinuations than placebo. Venlafaxine was linked with an increased risk of engaging in suicidal thoughts or attempts compared with placebo and five other antidepressants. The authors warn that due to the lack of reliable data, it was not possible to comprehensively assess the risk of suicidality for all drugs. 22 (65%) trials were funded by pharmaceutical companies. Ten (29%) trials were rated as high risk of bias, 20 (59%) as moderate, and four (12%) as low. Overall quality of evidence for primary outcomes was rated as very low for most comparisons, which restricts the implications of the results for clinical practice. Writing in a linked Comment, Dr Jon Jureidini at the University of Adelaide in Australia questions how many more suicidal events might have been revealed had individual patient-data been available.